A simple holiday greeting from ZFb, with a reminder of what’s really important this time of year. Atheist Free Speech = Atheist “Hate”? Religious Indoctrination at a Discount! Long-time followers of the blog will recall my post from last year about why I really like the holidays so much. Rather than regurgitate my reconciliation of my atheism with a not-so-secular holiday, I thought I’d share a simple thought today (Christmas Eve for many). Lots of billboards debate the reason for the season. Some atheist groups like to point out that Jesus is a myth, which is a reasonable point. Some Christian groups like to hammer home that Jesus is the reason. I never understood what makes the birth of a baby in a stable a compelling story unless you 100% accept the virgin birth, which I think is a stretch for most believers. (That’s besides the fact that if Jesus was born, he most definitely was not born in December.) Jews, meanwhile, already celebrated that there was enough oil to burn for eight days instead of one—not as miraculous as the virgin birth of a god, but at least a bit more original (or did Osiris have long-burning candles, too?). But that’s why we have holidays around this time. It’s dark. So we need to light it up and warm it up (though admittedly, the wintry association with this time of year is biased to the Northern Hemisphere). We need pretty lights and warm food and stirring music and good company. We need to make each other smile and show each other how much we love each other and exchange presents as tokens of that love. And that’s it. That’s all it’s about. That’s all that’s important. No myths or legends necessary! Just the intention to warm the hearts of your loved ones. We all owe ourselves and each other to do so at least once a year, and what better night than (almost) the longest of the year? So whatever you do this holiday season, enjoy it. Do what it takes to make it really feel like the holiday season and not just the dark one. Celebrate that which makes us all human: love. Season’s Greetings from ZackFord Blogs! There are only 67 days until Christmas!!! First, let me say that even though I’m a good 21 years older than anyone probably interested in these toys, the “pop” sound is strangely appealing. If you visit the Pop On Pals website, you’ll see what I mean. I think it’s totally a Freudian thing. This toy has the potential to really help young people be creative and inspired, and yet how it has been marketed does anything but. The gender policing in the video and in the way these sets are sold is remarkably archaic. What troubles me more isn’t just the gender limitations afforded to the toddlers by how the sets are sold, but also the way the marketing encourages parents to reinforce gender norms. The sad part is: by age two or three, the kids already have all the messages. The video makes it pretty evident which characters are geared toward which gender, but the way they’re sold really clears things up. Boys get to be a policeman/baseball player, a handyman/fireman, and a farmer/doctor. They also get to drive the garbage truck and dump truck. Girls get to be a ballerina/musician, a princess/chef, and a pet doctor/gardener. They also get to drive the ice cream truck and ambulance. Now, the video does point out the potential for “creativity.” The “funnest” combo is a bird doctor, the “silliest” is a dog pilot, and the “most imaginative” is the fireman ballerina. I’m sure as we get closer to the holidays, the frequency of toy commercials will increase dramatically. Just remember: Blue is for boys (who get real jobs), pink is for girls (who get to wear tutus, garden, and bake), and most kids who play with new toys are white. Every time atheism gets attacked, it makes me wonder just how insecure some folks must be with their beliefs. Atheists, as a stigmatized group, are an easy target for that insecurity, and William J. Kelly, Republican candidate for Illinois comptroller, is very insecure. Because I haven’t covered this issue before, here’s some background. 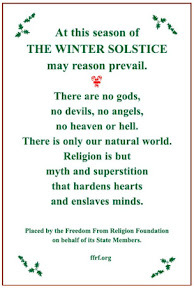 At the time of the winter solstice, let reason prevail. There are no gods, no devils, no angels, no heaven or hell. There is only our natural world. Religion is just a myth and superstition that hardens hearts and enslaves minds. This was in addition to a Christmas tree, a Soldiers’ Angels wreath, an ACLU tabletop display defending religious freedom, a Hanukkah menorah, and even a Festivus pole. And back in December, William J. Kelly was not happy with the sign, calling it “hate speech,” and wanted to remove it. When he attempted to turn it over, he was escorted out by Capitol police. Kelly’s attorney filed a lawsuit for declatory relief and permanent injunction Thursday morning, stating the Freedom from Religion’s sign violates the U.S. Constitution’s Establishment Clause. Towards any WHAT? I bet it says “person,” but just sounds so much juicier as an ellipsis. And wait a second! Accommodation?? I’d love to see that substantiated. Maybe he thinks the Establishment Clause is supposed to establish something? Dude, we’re just stating facts. There’s no hate. There’s no threatening. Heck, if anything, the sign implies fear of religion. I’m afraid of cutting my hand or fingers off, but that doesn’t mean I hate electric saws; it just means I don’t use them. The foundation does not approve of the nativity scene, Barker said. “The totality of the language of the sign is hostile and inflammatory to all religions, including but not limited to Christianity, Catholicism, Judaism, Islam and others that worship God and/or believe in the concepts heaven and hell,” the case claims. Really? We’re not just expressing hate, but hostility too? This is what I mean by insecurity. Kelly believes something. The sign calls his beliefs bunk. Kelly FLIPS OUT. This is religious privilege at its most obvious. Whenever I’m told that I should “respect beliefs” the same way I expect my own point of view to be respected, I remember that too often my point of view is not respected. There is no room for a healthy debate. I have facts and understanding to substantiate what I don’t believe, and when I state them, believers either disregard them or retaliate against them. That’s not mutual respect. And you know what? I don’t respect beliefs. 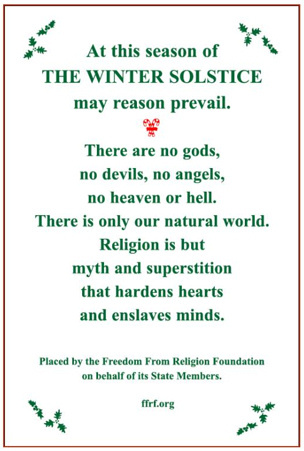 They are myth and superstition. But that doesn’t make me a hater. That makes me an atheist. But believers are so insecure, they can’t see the difference. Any minute challenge to what they believe is considered an attack, and our society has to learn to stop humoring that attitude. That’s where the hostility is coming from. » Don’t forget! Tonight is the finale of The Sing-Off. Voices of Lee, the group from gay-hostile Lee University, is in the finals. » On Friday, I wrote a piece called, “How Long Until We Have Campus Atheist Resource Centers?” This post, while seemingly about a very specific concept, is a piece I’m very proud of. Even if the idea of college diversity education isn’t totally relevant for you, this article is an effective synthesis of a lot of the writing I’ve done over the past year. I hope you’ll take some time to read through it and check out the previous posts that inform it. » I am proud to say that the UK-based online publication Gay & Lesbian Humanist has published one of my articles this month. 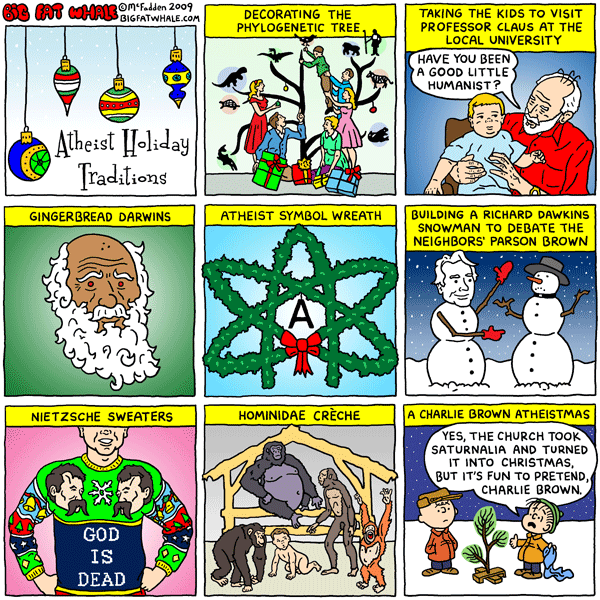 While hopefully you’ve already read my piece, “An Atheist Who Loves The Xmas Season,” I definitely encourage you to visit the G&LH site and check out their other content. » Peterson Toscano, well-known ex-gay survivor and advocate, has offered some kind words about ZackFord Blogs on his own blog. If you haven’t ever watched any of his videos before, you are missing out. » In October, I wrote a piece called “Hope College Prefers Moral Ignorance Over Cognitive Dissonance,” about the decision of Hope College to ban Dustin Lance Black and his film Milk from campus. Today, Dustin Lance Black has a detailed account of what happened from his perspective and the very positive events that have transpired since. It’s definitely worth reading. » If you didn’t already notice, ZackFord Blogs now has its own Facebook Fan Page. It’s an easy way to follow ZFb updates and hopefully create further discussion too! » If you haven’t already, make plans to attend the National Gay and Lesbian Task Force 2010 Creating Change Conference this February in Dallas! Yours truly will be there along with Ameriqueer/Bilerico blogger Phil Reese and many many others! I hope to see you there!! » One of my favorite holidays of “The Holidays” has gotten very little attention this year: Decemberween. 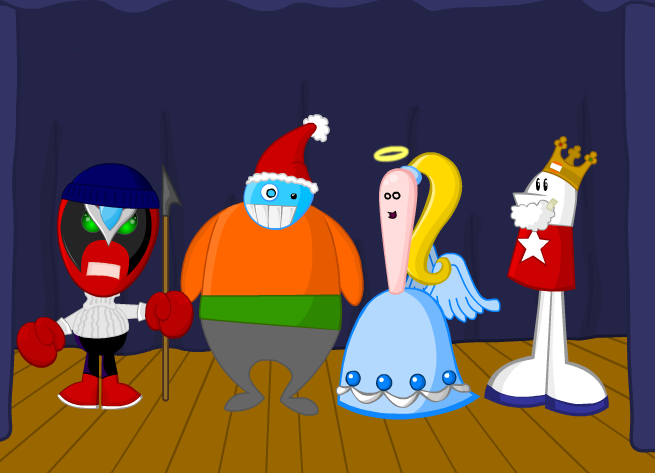 Celebrated exactly 55 days after Halloween, Decemberween is a truly festive holiday. After the traditional meal of bunnies, gather ’round the fire to reflect on how Archibald and The Popular Vote helped welcome The First Decemberween. May you all have the best Decemberween ever. » I’ve written a couple of posts this year about the “War on Christmas,” and thankfully, the “war” had very little momentum in 2009. Because of all the business about the Gap ads, I thought I’d leave you with a delightfully gay parody of them (Hat tip JMG). Happy holiday Monday! ZFb has felt pretty heavy lately, so here’s some good clean fun, courtesy of David Willis’ Shortpacked! By the way, apparently a GAP commercial recently featured the word “Christmas” prominently enough for the AFA to call off their boycott. I think that makes the AFA look weak. They’re like Beetlejuice, just say “Christmas” three times and they appear and get all smarmy about it. Today is Black Friday, the biggest shopping day of the holiday season (though I hear Cyber Monday will be big too). 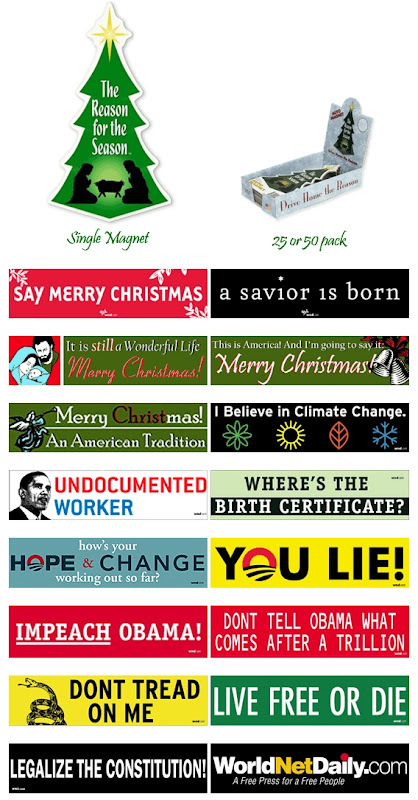 For $30 of purchases, you get a “Say Merry Christmas!” bumper sticker, so that not only can you show what a proud Christian you are, you can show what an arrogant prick you are for expecting everybody to conform to your religious practices! For $50 of purchases, you’ll also get the extremely well-researched and objective documentary, “A Question of Eligibility.” You and your family can have holiday viewing parties of this bestselling film and it’ll be the perfect yule log to fuel your inherently racist and paranoid hatred of our unfairly-elected President! For $100, you’ll get your own copy of Joseph Farah’s “Taking America Back,” signed by the author! You’ll dedicate many hours to practicing your reading skills and convincing yourself that America has become a one-party system that kowtows to the “all-powerful secular state,” even though it’s the conservative Republicans you support who prevent any reform or progress in society. And, if you spend over $150, add to your collection David Kupellan’s “The Marketing of Evil,” also signed by the author! Have you been trying to figure out why things like divorce, abortion, body piercing, and talking openly about homosexuality have become so popular and accessible? It obviously has nothing to do with the development of sexual literacy or the resistance to patriarchy that has fueled much of the social justice progress we’ve experienced. That’s just evil in disguise, marketed effectively. I know I get sucked into those cunning abortion advertisements all the time. Now you’ll finally get to the bottom of these dastardly schemes out to destroy your narrow archaic view of morality! Of course, in addition to all the other books and films for sale, you can check out WND’s incredible line of bumper stickers. You are sure to find just the right stickers and magnets to help everybody know just how stupid, insensitive, and bigoted you are! Truly, WorldNetDaily knows how to make the season a bright and loving time for our nation. I can’t help the fact that I was raised by a Christian family in a Christian home. What I can help is what I believe (or in my case, what I don’t). And even though I don’t care at all about virgin births or any other such nonsense, there is a lot of culture around the holiday season that I can and do appreciate. In fact, I love Xmastime. As for songs about angels, mangers, and shepherds, I appreciate them in the same way I appreciate most religious music. I think the story is just as fictional as Santa or The Grinch, but I know it has a different connotation for others. Much in the same way I enjoy gospel music, I appreciate the musical beauty and conviction of the true Christmas carols. I find the chorus of Angels We Have Heard On High (Glooooooooooooooria…) quite rousing, and I don’t think anything is as powerful or stirring as a committed performance of O Holy Night. I can sing these songs the same way I can sing Handel’s Messiah or a Mozart Mass; I don’t feel like I’m participating in a religious ceremony or committing my own belief. I am sharing in an art form that just happens to have been motivated by (or paid for by) religious beliefs and believers. I think the holiday season evokes a particular kind of emotional closeness that much of the music echoes. It’s a “special time of the year.” Thanks to Christian imperialism in America, it no longer matters why any person believes it should be a special time of the year. The commercialization of the month of December and the closing of schools and businesses at the end of the month signal that this is a time dedicated for everyone to be with their loved ones. I can watch Love, Actually year after year (and I do) and still tear up every time (and I do) because it channels the intimacy of the holiday season. It’s a time to set aside our studies and our careers and focus on the personal aspects of our lives that truly matter so much. While I’m not happy about how we got here, I certainly don’t think there’s anything more humanistic than this holiday sentiment. The trick is to not force traditional religious Christianity upon anybody. I think the AFA and their bratty goal to infiltrate the culture with strict references to Christmas as a religious holiday is petty and blatantly exclusive (read other posts about the “War on Christmas” here) . I think public displays related to the holidays have to be very careful. The town I call home is in a rural, conservative Christian area, and I am constantly dismayed to see creches, lighted angels, and other religious symbols displayed on government property. I think this is totally inappropriate. The bottom line, I think, is that it is quite possible to enjoy much about the holiday season without a single religious belief. I am an atheist and believe none of the nativity story (except I suppose for the fact that Jesus was, in fact, born at some point—not December 25, though). Despite being totally fictional (and unoriginal), it’s still a lovely story I can appreciate. More importantly, what the month of December has become is truly a cultural tradition that I think is hard to avoid if you live in the United States. I think there are many healthy ways to participate and enjoy these many seasonal activities without believing in anything religious and without enabling the Christian imperialism that got us here. I hope you enjoy my holiday blog logo and understand why I included the symbols that I did. I’m sure this won’t be my last post related to the holiday season, but I wanted to offer a definitive perspective on Xmas from an atheist, who will, in fact, be celebrating the holidays. Happy holidays to all of you from ZackFord Blogs! !